Thanks to cheap Chinese manufacturing and our endless faith in 'warmth', the world is full of really cheap tube preamps (the Art Tube MP is less than £30). This £55 Studiospares Mono Valve is a rebadged Soundking MAP100TU (the picture is actually a Norwegian version). Soundking are a vast Chinese factory employing 2,200 people. Even so, I'm strangely drawn to it. Why? 1) You don't see 'Valve' used so much any more, even in England, home of the Valve Sound System. 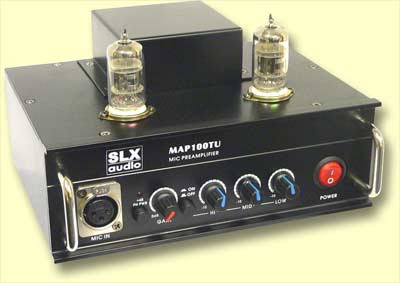 2) It has an eq (though it doesn't seem to be valve powered 3) It doesn't just have the same 12AX7 low-voltage tube that everyone else has. No, it has two 6N3 tubes, which are some Chinese number that nobody uses. I'm sure it sounds very ordinary, and certain that Eric Barbour wouldn't approve, but... 4. It weighs 2.1kg, as much as a brick. 5. It has a built in PSU rather than a wall-wart. 6. It looks ugly/beautiful. The only downside for me is the XLR output on the back (I'd need another cable) and the lack of an instrument input. Anyway, what's a better way to spend £55? "Anyway, what's a better way to spend £55?" Don't complain to me if it (a) sounds bad, and/or (b) dies prematurely. Chinese tube electronics tend to do these things.